Is YouTube Direct Right for Your News Organization? 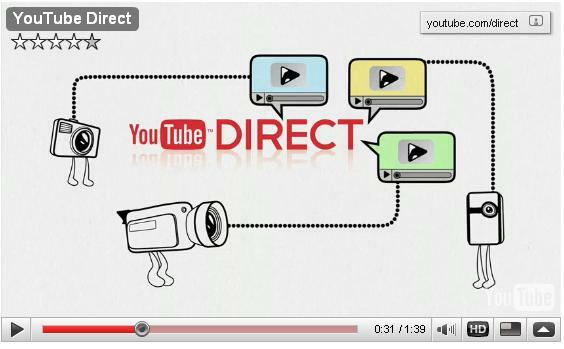 Expect to hear a lot of buzz about YouTube Direct. And, for good reason. It may be the solution for you to get user-generated video and viewer comments on your site, or on-air, without costing you anything. Except, this model has no revenue component, a fact established solutions like YouNews, USTREAM , KickApps , will surely point out. Oh, and you are helping YouTube build out it’s news presence online. YouTube Direct allows you to embed the upload functionality of YouTube directly into your own site, enabling your organization to request, review, and re-broadcast user-submitted videos with ease. News organizations can ask for citizen reporting; nonprofits can call-out for support videos around social campaigns; businesses can ask users to submit promotional videos about your brand. With YouTube Direct, the opportunities to connect directly with the YouTube community are endless. Here’s how to sign up and start uploading. * Organize media contacts by geography, beat, past interaction, etc. Though Twitter Lists are new to most users, some news organizations are trying to stay ahead of the curve by taking advantage of the new feature and implementing it quickly. Whether by creating staff directories to make their journalists easier to find, or recommending tweeps to follow on specific subjects, Twitter lists are giving news sites the ability to curate news and further open up to Twitter users that can help them to gather news. via 4 Ways News Organizations are Using Twitter Lists. What’s the weather, what to wear? Obama helps you everywhere! The site gets a detailed weather report from a weather.com service, analyses a relation of temperature, humidity, strength of wind and some other characteristics and, finally visualizes the most comfortable set of clothes to wear this day. Of course, our commander-in-chief models the clothes you should be wearing. The site sez: You don’t have to check your thermometer anytime you go out in order to decide what clothes to wear. No more ‘let’s look out of the window to see what people wear today’ or go out to the balcony to feel if the clothes you’ve chosen is ok not to get freezed or hot. All you need is to check what Obama or his friends wear. Moreover, obama-weather.com can become your major adviser while planning a business trip or a vacation journey. You’ll always know for sure what type of clothes you should take with you. Maybe a fun feature for the end of the weather segment or at the end of the newscast. As expected, Ashton, Oprah, Ellen, and CNN Breaking News made the top of the list. Products and shows like Chelsey Lately, Martha Stewart, and Whole Foods Market are in the 2nd 25. Also, notice how few people the top Twitterers follow. BTW, Griff Potter is ranked 206,631st on twitterholic! THE REST OF THE LIST >> HERE!